To increase your chances of seeing some meteors, it’s also good to get away from the light pollution of cities. You want the sky as clear and as dark as possible. Want to receive reminders of more astronomical events like meteor showers and lunar eclipses? Then sign up for our free weekly newsletter. Night mode — great for planning shots of the Milky Way! 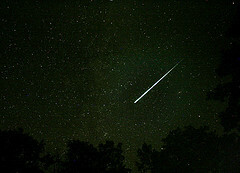 Event lists — showing you dates of meteor showers and eclipses! So, if you haven’t updated TPE in awhile, I recommend doing so to take advantage of some cool new features.